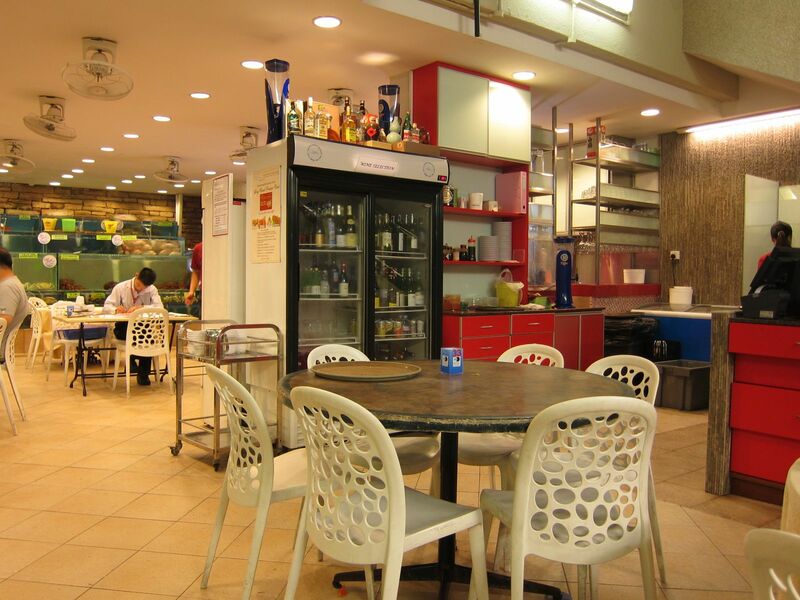 The last time I was here, I had feasted on Singapore’s celebrated dish, the Chilly Crab. Discussing this dish with local friends, I also realized there are two kinds of crab lovers in this food-loving nation-city: those who swear by chilli crabs and those who prefer the pepper crabs instead. 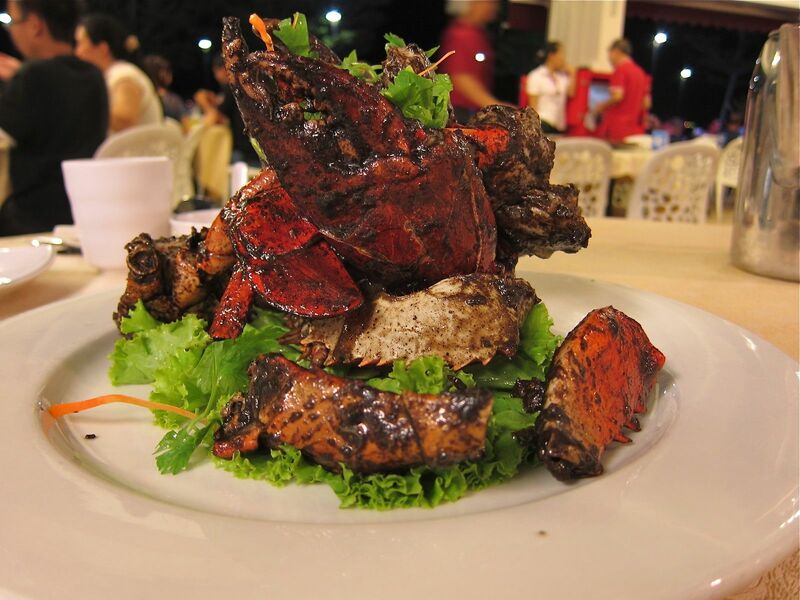 Aha, I thought, what better excuse than this to plan another primeval crab dinner, the Singapore way. Off we went in the hunt for the perfect Black Pepper Crab, with my friend Steven acting as the local guide. No Signboard, a highly regarded seafood chain, was our first stop. However, we could not manage seats there. So we took a taxi to the nearest Long Beach Seafood Restaurant, the chain that claims to have invented this dish as far back as 1959. The moist paper towel comes in a strange packaging - the babe in the red swimwear serving crabs in the picture is that of an American beauty queen from 20 years back! Not sure how she ended up promoting crabs for Long Beach. Steven wanted me to try something new. He ordered a starter of steamed bamboo clams with glass noodles. I had never this creature before, let alone eaten one. As you can see below, the bamboo clam gets its name from its unique shell. The dish was put together very well - the seafood, noodles and the spicy garnishings making for a very tasty bite before the crabs. 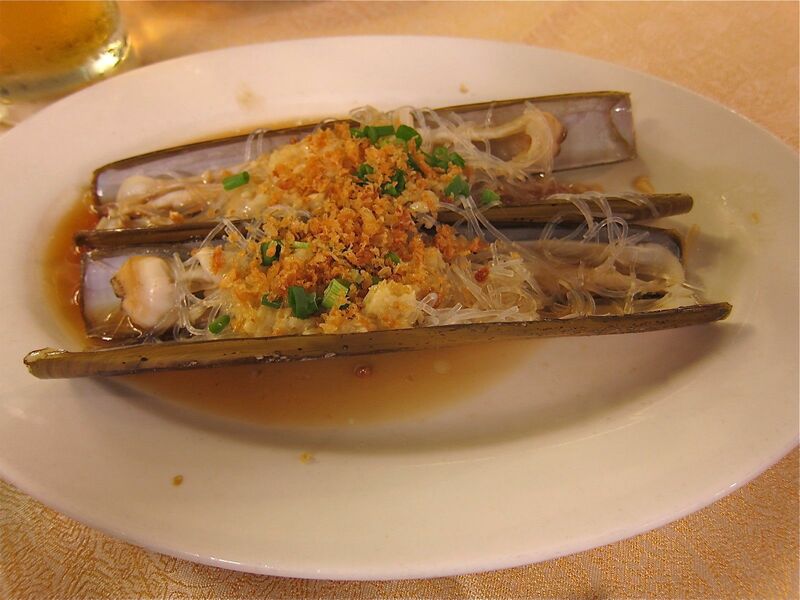 The bamboo clams are more commonly known as Razor Clams in the western world. A kilo of crab can seem overwhelming. But we were hungry and it didn’t take too much time to polish off all those hard-to-get but oh-so-delightful pieces of crabmeat. Some Chinese fried buns and Tiger beer helped them on their way! Given my penchant for spicy food, I think I will rate the Black Pepper Crab a wee bit higher than the Chilly Crabs of Singapore. We ended with another dish very unique to this part of the world. 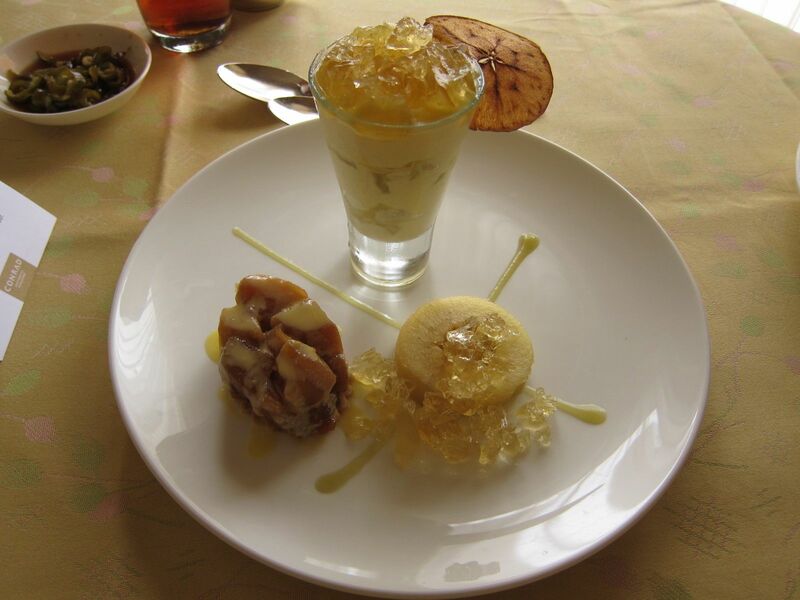 The Durian Ice-Cream is made from the stinky durian fried. The fruit has a very intense smell which many find offensive and yet you find it everywhere in Malaysia and Singapore, even though you are prohibited (!) from carrying it in a public transport in this country. If you are familiar with the smell of a ripe jackfruit, this one has a little more intense smell. 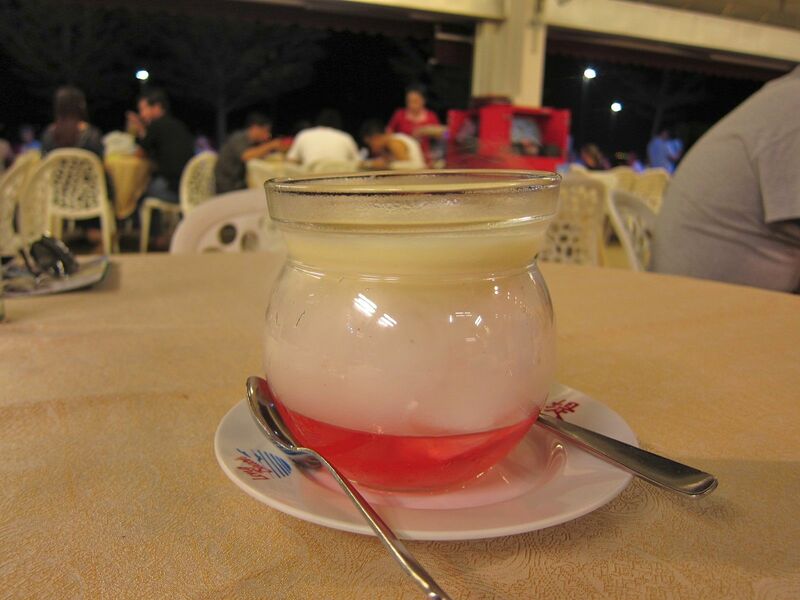 However, the ice-cream itself was good, served in a special glass bowl with smoke or vapor of some kind in a lower chamber to give the dish an interesting effect. The next day, I tried the room service at my hotel, The Conrad. They have a rather nice Cantonese restaurant called the Golden Peony in the hotel; select items are available in the room-service menu. The Golden Peony Style Fried Rice was fantastic as was the artfully presented Dessert, called the Study in Apple and consisting of green apple trifle, apple mousse and apple tart tat in. Overall, Singapore continues to be a fun place to spend a few hours. You never have to repeat a restaurant here! It is always pleasant experience to read your foodie blogs..I could not- read for last few months because of year end..Skipped week end nap today to read(& virtually eat) your Stuff! Wow..the rice at the end was so neatly photographed..Thanks! 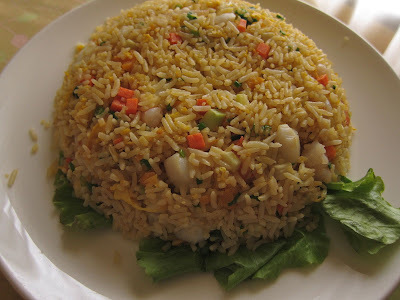 Its nice to see a food lover like you and all your posts. Looks like u travel a lot and post as much as you can. @Abhay: Hey, thanks! Good to hear from you. @Vanessa: Thanks for asking, but I don’t blog for monetary considerations. This is purely a hobby! @Shital: Thanks for your kind comments.